Gourmet Pigs: Water Menu at Ray's and Stark Bar: Can You Taste The Difference? Water Menu at Ray's and Stark Bar: Can You Taste The Difference? Yes, Ray's and Stark Bar now has a water menu of twenty different still and sparkling waters, complete with their own water sommelier, Martin Riese. 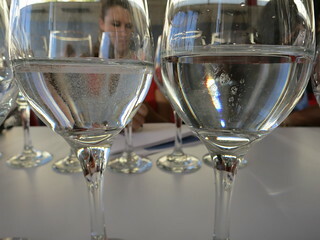 When I was invited to a water tasting there, I was both tickled and curious. A "water menu" seems excessive, but I was curious if I can really taste the differences between different brands. I mean, I knew there was a difference because I never really liked Voss but have always loved Fiji, but I wanted to see if it really makes a big enough difference. Martin explained that the different flavors of water comes from the different mineral contents according to the water source. The waters are labeled by their "TDS" number or "total dissolved solids". 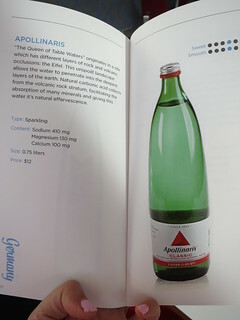 The water menu itself is pretty impressive and beautiful, with the mineral contents and flavor profiles of each water listed next to a beautiful photograph. So, the short answer to my question was YES, I can certainly taste the differences. Voss has a low TDS (6 mg of sodium, 1 mg of magnesium, and 5 mg of calcium) and has a little bitterness/sharpness at the end. 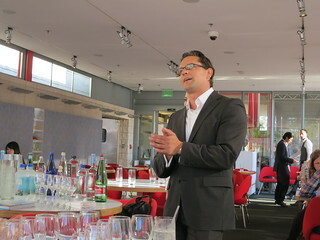 Martin suggests that Voss would go better with salads, while Fiji would be better for desserts. 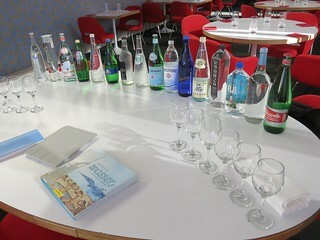 After the tasting, I think Fiji is still my favorite still water! Fiji's aquifer is hundreds of feet below the edges of a rainforest and the water that goes in there had gone through layers of volcanic rock, creating a natural filtration process. Fiji has a slightly higher TDS (18 mg of sodium, 15 mg magnesium, and 18 mg calcium) and it has a softer, almost "buttery" (as far as water can be buttery) mouthfeel to it. I also discovered a sparkling water I liked, Badoit, from the Loire region of France. It has tiny bubbles that you'd see in a fine champagne and still tastes light even though the TDS is significantly higher than that of Fiji. 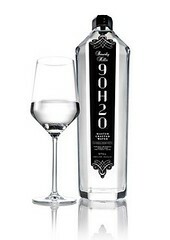 Martin also recently created his own line of water called 9OH2O. He takes spring water from the Sierra Nevada Mountains but then added minerals to achieve the balance he desired for food pairing. The water also has a pH of 7.5. According to Martin's explanation, he made a water with high TDS (390) so that if you drink the water after red wine, it doesn't cleanse your mouth and will retain the taste of the wine. Another interesting one is the one in the glass on the left below: Iskilde from the Danish lake highlands. Iskilde means "cold spring" and indeed this particular artesian spring is normally 7-8 degrees Celsius. This is still water but it uniquely has a high oxygen content that creates mini bubbles as you can see in the picture below (compared to another still water), but it's not "fizzy". This water's not filtered and bottled straight from the spring. If you still believe that water has no taste, try the Vichy Catalan. This water is from a hot spring in Girona, Spain and has a TDS of 3,052 mg per liter which includes 1100 mg of sodium! Yes, you can certainly taste it. This would be good to be drunk with food, but I doubt I'll want to guzzle it after a hard workout. It's not just about having the selection, but having a water sommelier there allows those of do not or cannot drink wine to have an interactive experience of tasting and pairing the waters with different food with the help of Martin. He's had people who appreciated the program because they missed having the interaction with a sommelier when they could not longer drink wine due to health reasons. At any rate, I've had my eyes opened with regards to the tastes of water so next time so you see a water menu, just keep an open mind!